Feb. 28, 2011, 7:47 a.m. 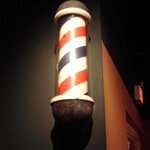 The barber’s pole is one symbol of the bloody past of modern medicine. In the late middle-ages barbers not only cut hair but also performed bleeding, cupping and leaching – common ‘medical’ practices. The ill were actually better off not going to a physician. Today the drawing of blood as a treatment is only used in very specific circumstances, e.g. to reduce the amount of red blood cells in cases of haemochromatosis.